Keep a spare ThinkPad 90W AC Adapter at hand to ensure your ThinkPad has a consistent flow of power. Keep one adapter in the office, one at home and another in your carrying case for immediate, convenient access to power. 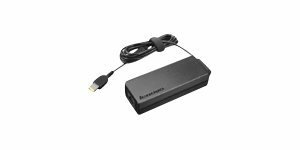 This ThinkPad AC adapter is perfect for use as a spare or replacement adapter for compatible laptops. It is compatible with all Lenovo laptops with the rectangular "slim-tip" common power plug. It is not compatible with legacy notebook systems with the round, barrel-type power plug. ThinkPad AC adapters are compact so you can easily keep a spare tucked into your carry case at all times. This 90w adapter will perform to the exact same standard as the one which originally came with your laptop. It is highly energy efficient and is backed by an official Lenovo 1-year warranty. Have power when you need it, where you need it, anytime with the ThinkPad 90W AC Adapter. Keep one in the office, another at home and save your batteries for the road. Just plug it into an available wall outlet to deliver AC power to your compatible Lenovo laptop and to recharge the system battery. ThinkPad AC adapters are compact and energy efficient. Get power when and where you need it with a ThinkPad AC adapter. Keep one in the office, one at home, and another in your carrying case for convenient access to power. ThinkPad AC adapters are compact and energy efficient. Performs to the same specifications as the standard AC adapter that ships with the Lenovo laptops.